When is the best time to harvest yarrow? Like waiting on strawberries to be ripe, judging the best time to harvest yarrow means you’ll need to check your plants periodically and evaluate what stage they have reached. 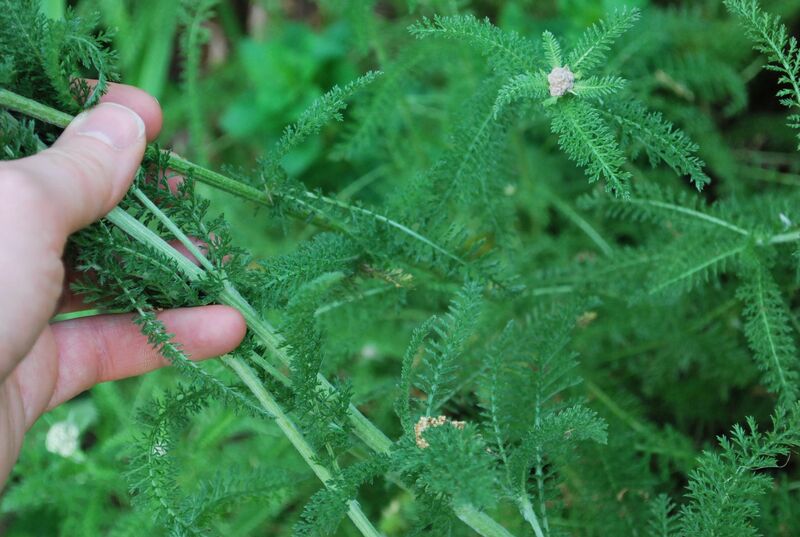 Here’s how to tell the best time to harvest yarrow based on your weather and the plants themselves. Your timeline for harvesting yarrow will vary based on your winter and spring weather patterns. Variables from one year to the next can make your harvest earlier or later. 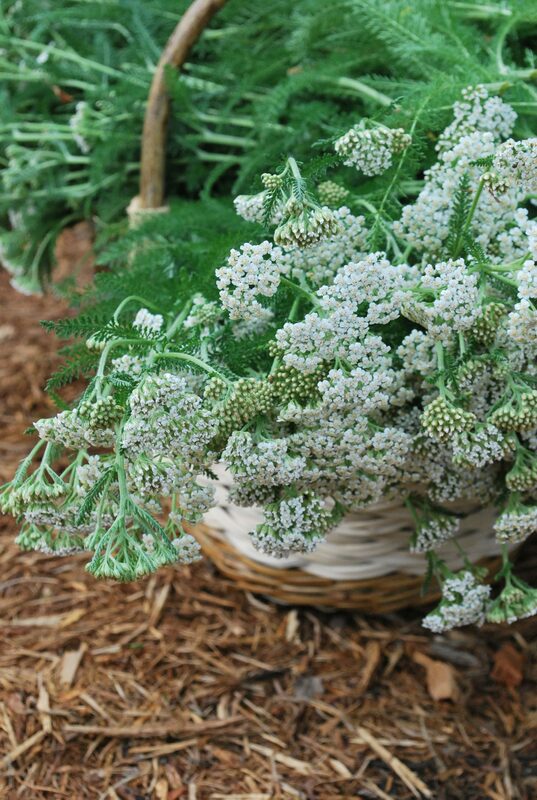 Once the flower stalks and buds appear, though, you’ll know that your yarrow harvest is only a few weeks away. In my garden, yarrow often begins stirring with our annual warm spell in February. I can usually spot new growth through March, and then by late April or early May growth really takes off. The yarrow patch spreads outward from the edges and the first flower stalks appear. By May, the flowers stalks are around 3 feet tall and the blossoms begin to open. I usually anticipate our first harvest sometime toward the middle of the month. 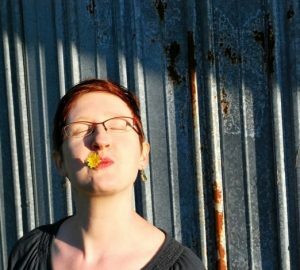 It’s important to wait until the flowers have fully opened before harvesting. Your yarrow may not have any fragrance at all until a few days after all the flowers have opened. I like to check mine before harvesting by crushing a leaf or two in the palm of my hand every afternoon. If there’s no fragrance, then be patient. It isn’t ready quite yet. 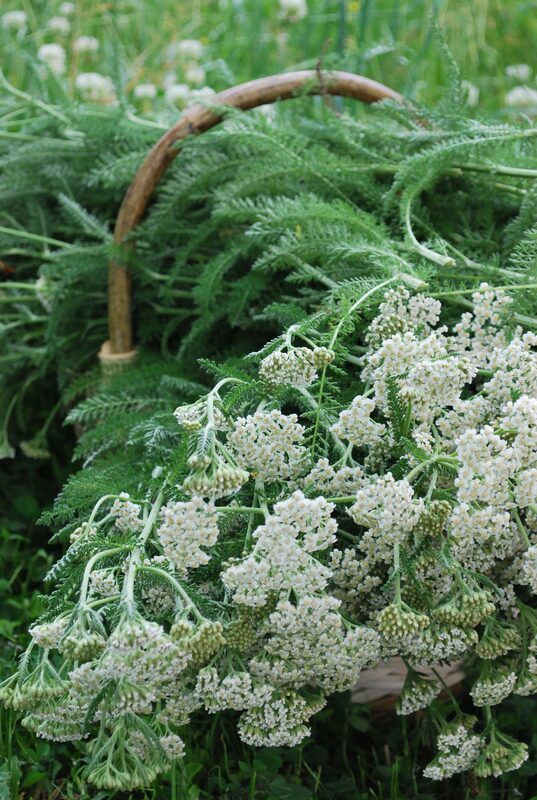 In my experience, the potency of yarrow is highly influenced by site, weather, and time of year. 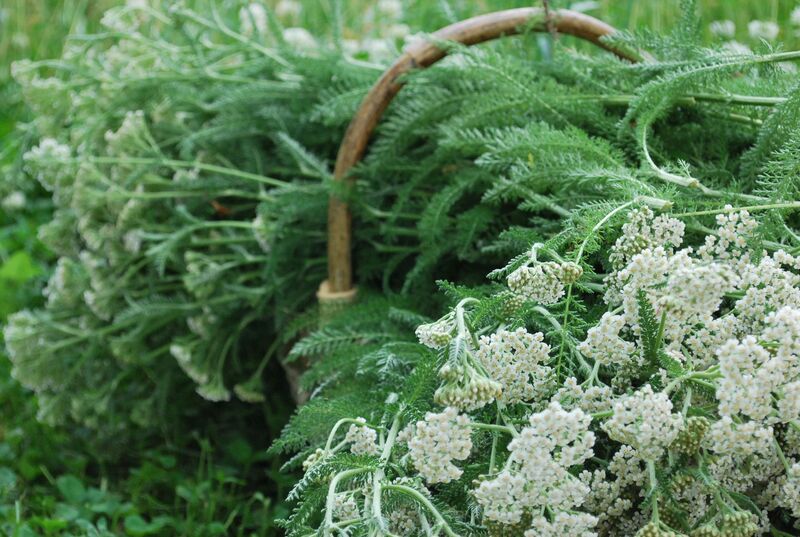 With yarrow, fragrance and potency typically go hand. This is because the plant is so rich in volatile oils. 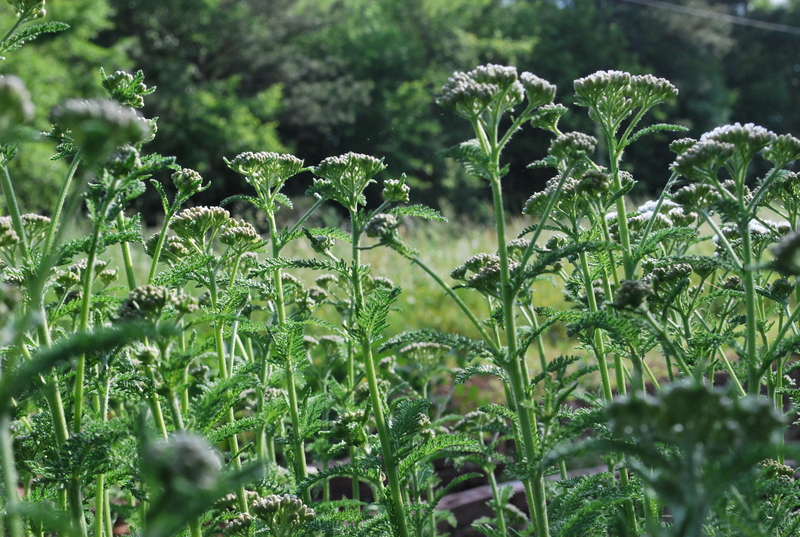 A yarrow in a “difficult” setting, where the soil is poor and there isn’t much water, will typically develop a heavier fragrance than one in rich, moist garden soil – although yarrow isn’t picky and will happily grow in either place! Warmth and rainfall also seem to impact yarrow’s potency. I’ve experienced years with heavy rains and cool summers when the yarrow foliage never really developed a fragrance at all, even though the same patch of yarrow is normally very aromatic. A hot, dry spell right before bloom seems to be ideal for producing the most fragrant leaves. The aerial parts of yarrow are the parts used in herbalism. This means that the flowers, stems, and leaves are all used. Wait for a nice, sunny day to harvest your yarrow. I like to harvest in the late morning after the dew has dried and a little sun has been on the yarrow patch. This seems to be when yarrow is at its most potent. If you follow a flower stalk of yarrow down toward the ground, you will notice that the fern-like leaves are present all the way down. I cut my flower stalks 2 or 3 inches above the ground so that there is still a nice mound of foliage left when I’m done. Rather than cut one stalk at a time, try gathering the cut stalks into the palm of one hand as you cut with the other. I can gather ten or so stalks this way, and it makes for less back-and-forth to the harvest basket. It can be a little tricky at first, but after a few tries you will fall into the rhythm of it. The stems can be quite thick, so pruning shears come in handy! Depending on the weather, we may have a second harvest in the fall. Sometimes this can come as late as November. This is because cutting all of the flowers before they set seed will encourage the plant to put energy into a second bloom. I only cut for a second harvest every few years, though. I like to harvest most of the blooms but leave some for our native bees, which go absolutely wild for yarrow. I also think it’s important to allow the plant to put plenty of energy every year back into its roots so that the stand stays healthy. Although it’s hard to believe that something as wonderful as yarrow could ever cause a problem, it’s important to note that some people can experience allergic dermatitis from yarrow (1). Yarrow is in the Compositae family, and this family can contain sesquiterpene lactones. 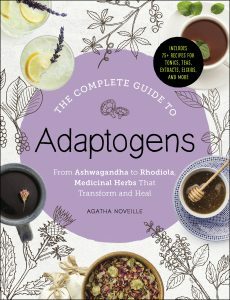 These naturally occurring chemicals are simply part of what makes these plants themselves, but they can be irritating or act as sensitizers (2). 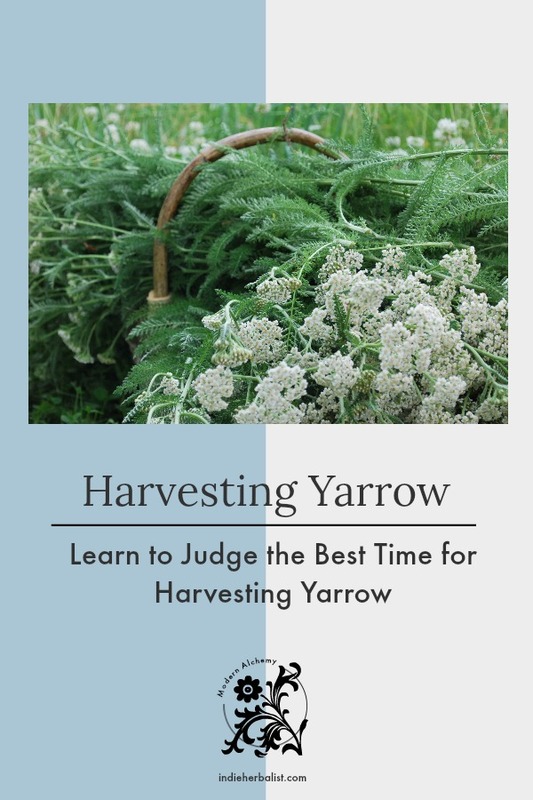 It’s not a common reaction, but it is one to be aware of if you regularly harvest large amounts of yarrow (such as if you are farming yarrow or growing cultivars for cut flowers), because of the potential for a sensitivity to develop over time from exposure. Personally, I have begun using garden gloves and long sleeves when I harvest yarrow. The amount we will be harvesting on our herb farm will be considerably more than for personal use. I’d rather not end up with an allergy to one of my favorite plants! The official yarrow used in herbalism is Achillea millefolium. This should be a white variety that is as close to wild yarrow as possible. Sometimes wild yarrow will be light pink, and these plants are fine as well. You may find a rainbow of yarrow blooms of in pinks, reds, and lavenders at a garden center. These might be A. millefolium cultivars (a “cultivated variety”) or they may be a different species all together. A. millefolium cultivars are often quite beautiful, but emphasizing the flowers through breeding can leave them lacking for traditional purposes. We have a cultivar of A. millefolium growing alongside the wild type in our garden that’s a great example. Even when covered in luscious, dark pink blooms the plant never develops a fragrance! There are yellow flowered varieties, too, but these are are usually a different species or a cross between species (usually A. fillipendulina). 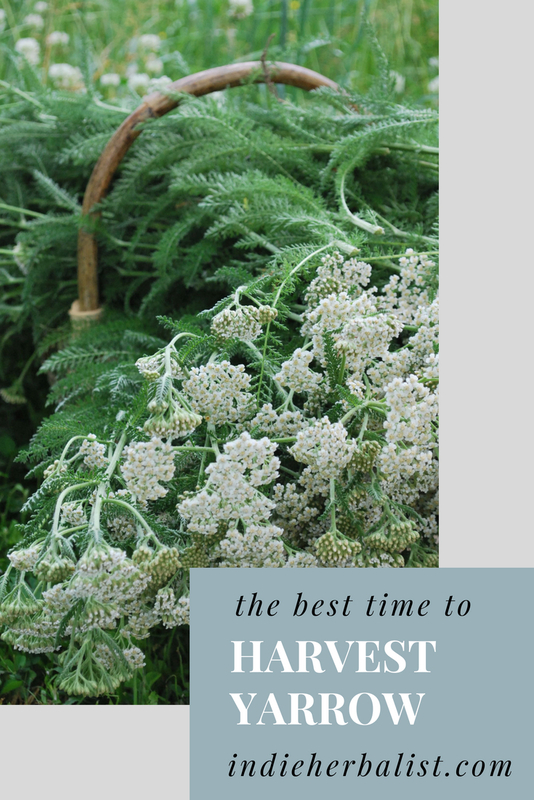 It’s easy to determine the best time to harvest yarrow. Taking a few moments everyday to check your plants once they begin to bloom is all it takes. 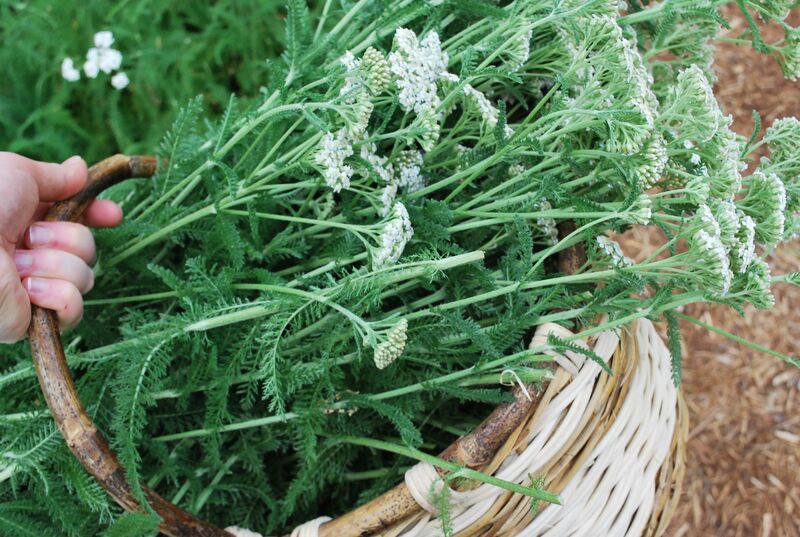 You will be rewarded with yarrow that you can dry and use at home that is far fresher and more vital than anything you can buy from a supplier!